Free BIXI Sundays offered by Manulife are back! BIXI trips are free on the last Sunday of the month, from May to October! Rent a BIXI for one-way trips of up to 30 minutes each. 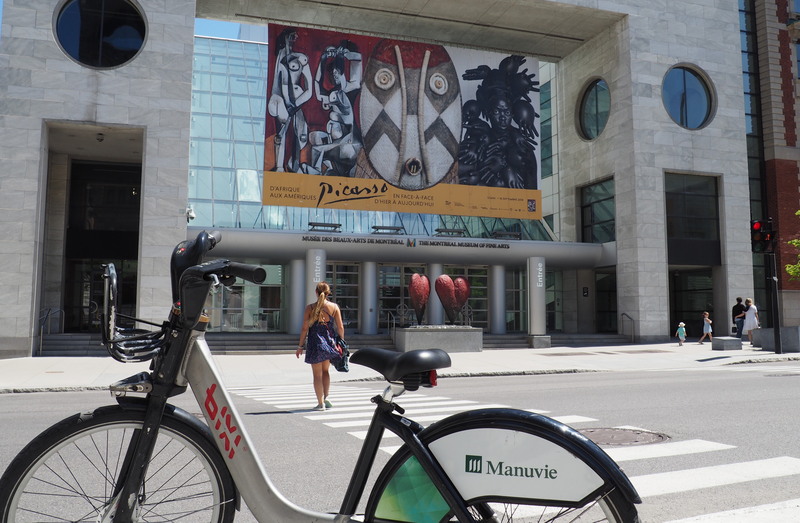 On the occasion of the first Free BIXI Sunday of the season on May 27, enjoy Montreal Museums Day! Visit over a hundred exhibitions through 31 museums for free. To discover the program of the event, visit museesmtl.org. Do not miss the presentation of the interactive installations of the last 10 years of the artist Rafael Lozano-Hemmer at the Musée d'art contemporain. A must see ! Travel to Egypt at the Pointe-à-Callière Museum and visit the Queens of Egypt exhibition. Through more than 350 objects, you will discover the fascinating destiny of these women. The Stewart Museum presents Paris on Display: in 18th-Century Boutiques, an exhibition including 250 decorative and historical objects and about sixty prints that will make you discover the most popular Parisian boutiques of the time. See the Cosmic Collisions show with the kids at the Planétarium Rio Tinto Alcan. The encounters between celestial objects can sometimes be explosive! After completing the transaction, type in the code you received into the keypad on the left side of the docking point of the BIXI bike of your choice. Go out and explore Montreal for up to a maximum of 30 minutes. Fees will apply if you go over the allotted period. Free BIXI Sundays are offered by Manulife, in collaboration with our health partner Rachelle Béry and La Presse+. Snacks are provided courtesy of our health partner Rachelle-Béry. Look for BIXI Manulife Valets this Sunday!